The 'Fotros' can fly 2,000 kilometers and stay in air 30 hours, armed with air-to-surface missiles. On Monday Iran announced its new combat drone, the "Fotros," which sports a range of 2,000 kilometers (1,243 miles), reports The Washington Post. Iranian Defense Minister Mohammad Dehgan noted that the armed drone "can fly at an altitude of 25,000 feet, with a flight time of 16 to 30 hours," and can carry out reconnaissance missions or air-to-surface missile strikes. Significantly, the combat drone would be able to reach Israel. 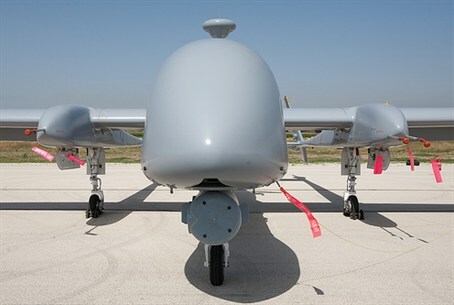 At the unveiling ceremony, Dehgan further stated that the drone "shows that sanctions imposed by the enemies are not an obstacle to the progress of the defense industry." Iran has been the subject of sanctions over concerns regarding the Islamic regime's nuclear weapons program. On Sunday Iranian Foreign Minister Mohammad Javad Zarif claimed his country had a right to enrich uranium on the basis of the Treaty on the Non-Proliferation of Nuclear Weapons (NPT). Development of the latest drone follows ongoing Iranian efforts to step up its domestic arms production, with Iranian developments reportedly driven by captured US drones. In August, Iran announced a program to teach high school students to hunt down and hack the controls of US drones. In September an Iranian attack drone which was unveiled a year before it is to become operational. The drone, named Shahed-19, was armed and also allegedly capable of reaching Israel, but could only stay in the air for 24 hours. That same month, Iran announced a new reconnaissance drone which reportedly resembled the American ScanEagle that Iran claims to have captured in late 2012.